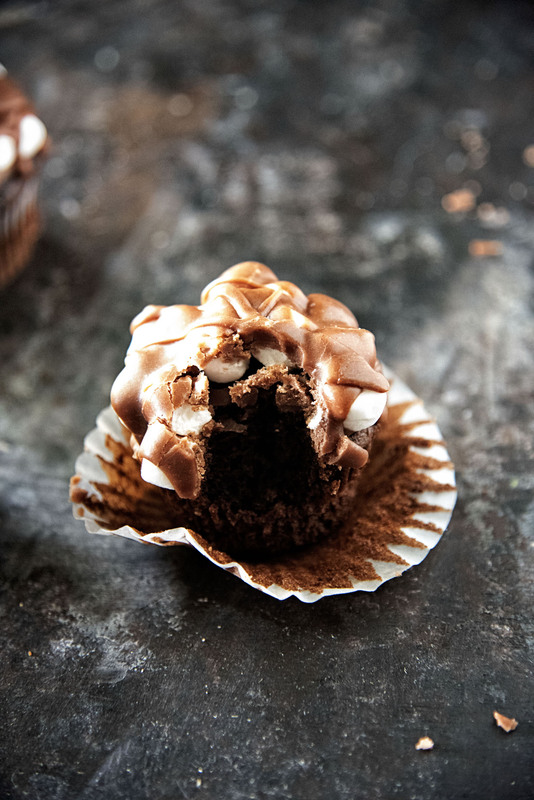 Chocolate Glazed Rocky Road Cupcakes: Rich chocolate cupcakes covered with mini marshmallows and chopped toasted pecans all covered in a super chocolatey glaze. Not sure how it all started. The idea that if we just weather a rough patch then everything will be great again. But if you have lived long enough you know that there is usually another rough patch waiting around the corner. That’s not negative, just realistic. So much so that I think we should stop saying we hit a rough patch. I have a tremendous amount of friends getting divorced or have recently broken up lately. I can’t help but think back to my divorce. As most readers know, my ex-husband and I remained friends. Which does freak people out a bit. Because we didn’t have kids, just a dog, and so there was no real need to stay friends for the kids kind of thing. It’s still the most asked question I get to this day…am I still friends with my ex? We don’t say friends now, we just say family. Does that mean we all hang out and go to dinner and what not? What that means is my husband goes over and helps with things at his house. I dog sit his pups a few times a week. Things you do for family. If you are going through divorce or break up or a rough patch…just know that it will all work out. Maybe not in the way you wanted but it does work out. Rocky Road is my favorite chocolate based ice cream. When a friend who is having some rocks in his roads had a birthday, I decided these would be the cupcakes to make. I really loved the glazed cupcakes I made at Christmas time and decided to go with glaze over frosting this time. These get double dipped so that you can use the glaze as a glue to keep the marshmallows and nuts in place. Using a stand mixer with a paddle attachment mix together sugar, flour, cocoa powder, baking powder, baking soda, and salt. Add in vegetable oil and milk. Add hot water and stir until the mixture is evenly combined. The batter is VERY thin. Fill prepared muffin tin cavities just over 2/3 of the way full. Bake at 350F for 18-22 minutes (use the toothpick test to check). Allow cupcakes to cool completely before glazing. In a small saucepan, combine milk, butter, and cocoa powder; bring to a boil. Pour hot mixture over powdered sugar and stir until smooth. 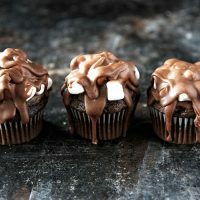 Lightly dip the top of a cupcake into the glaze, this will serve as the glue to hold the marshmallows and nuts in place. Dip into the marshmallows and sprinkle or place nuts in between the marshmallows. 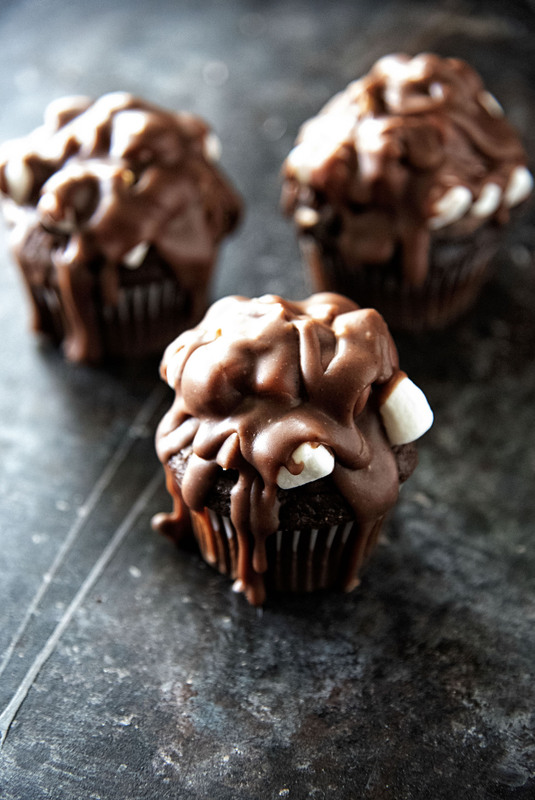 Once all cupcakes have been dipped and marshmallows and nuts are in place, spoon the remaining glaze on top of the marshmallows and nuts. Glaze will drip down the sides...that is fine. Allow glaze to set, about 1 hour. These look ridiculously good! Hope things settle for your friend quickly. THESE!!! These look amazing and do-able! I can’t wait to make them. 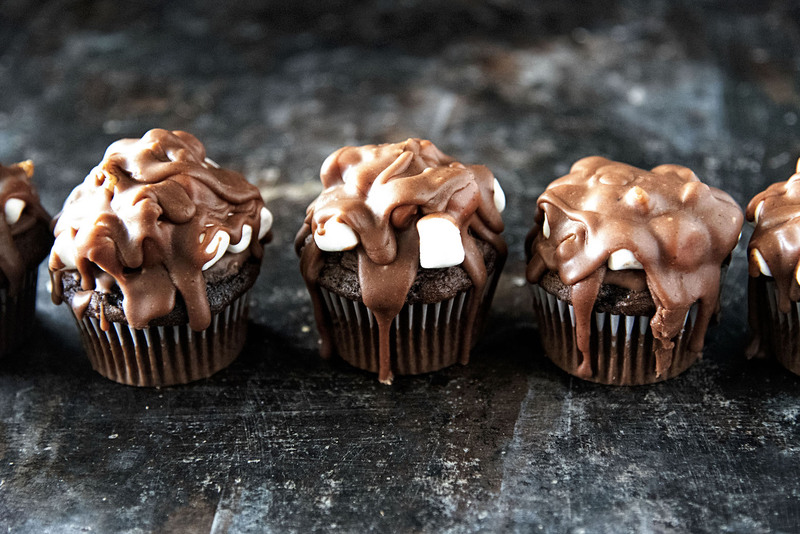 I’m drooling and can’t have them until my cheat day on Sunday!